What a difference a trade war can make. 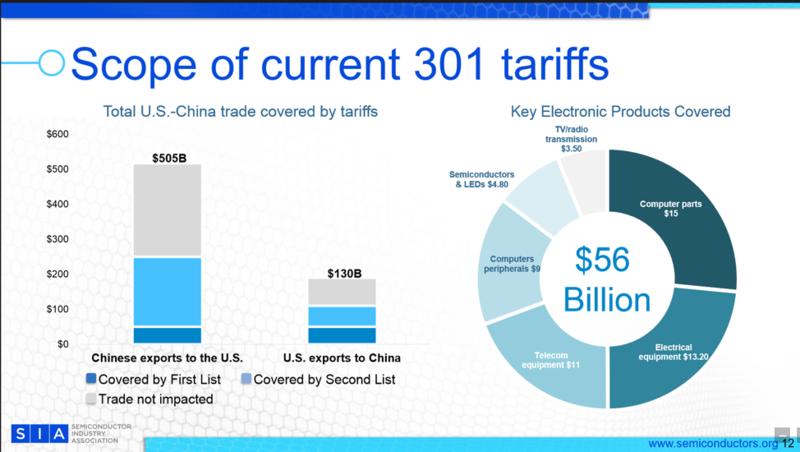 The World Semiconductor Trade Statistics (WSTS) organization held its bi-annual forecast meeting in Scottsdale, Arizona last month, and one of the topics that seemed to be on everyone’s mind is the impact of tariffs and the trade tensions between the United States and China. The need to impose tariffs on U.S. imports of semiconductors is perplexing and frequently confusing. President Trump has spent months blasting China’s trade policies, but offered some sort of truce following a meeting with China’s President Xi Jinping at last week’s G20 Summit. So far, there are no details of that agreement. Nor is there a clear explanation of what prompted these actions in the first place. In 2017 the United States maintained a semiconductor trade surplus of $2.1 billion with China. In addition, most of the U.S. imports of semiconductors from China are products from U.S. semiconductor companies that are either designed and/or have undergone front-end fabrication outside of China. Trade disputes can quickly spin out of control, as shown in a timeline presented at WSTS by Falan Yinug, director for Industry Statistics and Economic Policy at the Semiconductor Industry Association (SIA). In 2017, the Office of the U.S. Trade Representative (USTR) initiated a Section 301 Investigation. By April 2018, USTR released a proposed $50 billion tariff list and China quickly retaliated with its own $50 billion tariff list. SIA submitted comments to USTR seeking removal of 28 products of importance to the U.S. semiconductor industry. By July 2018, tariffs on the $34 billion “List 1” went into effect along with China’s retaliatory tariffs. USTR then released a $200 billion “List 3” subject to 10% duty which included printed circuit assemblies. A 25% tariff on the remaining $16 billion worth of goods (List 2) went into effect in August. The 10% tariff on $200 billion China goods began on Sept. 24 and was expected to be increased to 25% by the end of the year. Key electronic products covered by the tariffs currently amount to $56 billion, which include all U.S. imports of semiconductors from China. The impact of the G20 Summit deal on alleviating trade disputes — and a proposed new round of tariff to be imposed in January 2019 — remains to be seen. So does the impact of the recent mid-term elections. Several of the congressional districts that flipped from Republican to Democrat are districts that include heavy concentrations of semiconductor industry jobs. For example, Peter Sessions (R), Representative for the 32nd District of Texas was defeated by Colin Allred. Although health care was listed as the biggest issue for this District, Sessions was challenged for his inconsistencies regarding trade issues, specifically tariffs. District 32 includes approximately 15,000 semiconductor jobs, primarily those provided by Texas Instruments. In Virginia’s 10th congressional district Barbara Comstock (R) supports free trade but supported the Trump Administration tariffs, because they were a part of a strategy to get better deals for America. She was defeated by Jennifer Wexton (D). There are approximately 1,500 semiconductor jobs in this district, primarily provided by Micron Technology. Similar flips were noted in the San Diego and Irvine, California districts, as well as in Colorado’s 6th District. Although there was no consensus by WSTS meeting attendees on the impact of these tariffs on the overall industry, Semico recognizes the increased level of uncertainty is having an effect on company contingency plans. Partnerships, purchasing and inventory levels are all impacted by increased levels of uncertainty, and we already are seeing companies develop contingency planning scenarios.